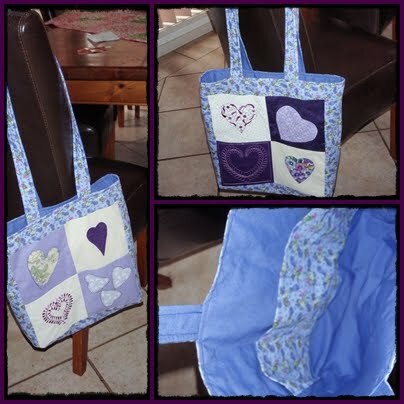 My 2nd finish for this year is this bag for Haylee. made from caring hearts that my Our Craft Forum friends nominated Haylee when she went to Kenya for a mission awareness trip in 2009. I made this bag while she was away over the weekend and surprised her. 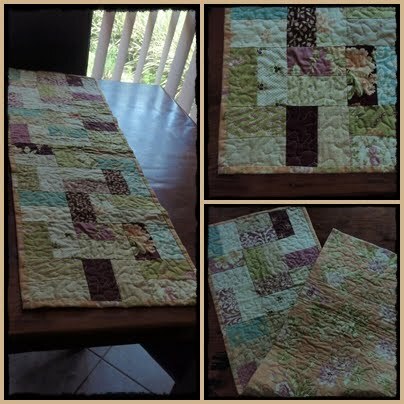 The third finish was a Fig & Plum table runner, I made as the example while I was teaching my friend how to quilt. All I needed to do to finish was the binding. I finished late last night. My fourth finish was a bunch of fibre book marks for work. I have signed up for the FMQ challenge over at SewCalGal I really wanted to work on my FMQ as I have 4 quilt tops I want to quilt myself and wanted to do more that the meandering I have been doing (& not all that well I might add), so this came at a great time. Each month they have a tutorial by a guest quilter and giveaways as well. This months guest was Frances Moore and she showed us how to quilt flowing leaves. This was one of those patterns I really wanted to learn and I was surprised by its simplicity. I started by practising of some scrap fabric, I have gone over the pattern a few times as I just wanted more practise, I need to work on the rotating so my leaves don't go all in the same direction. I hope to complete a table centre with this pattern over the next few days. Don't forget to enter my Violetta table runner giveaway in my previous post.